For months, this 7-year-old potted plant had screamed for a decent trim! It had straggly branches that looked so unkempt but as usual I had procrastinated with my garden chores. Finally, I relented and gave it a haircut, so severe that I almost bald it in late February. However, it was terribly happy and started throwing out flowering buds a week later. See, how handsomely it rewarded us. Hmm… it sure is a grateful charmer! Thank you… thank you, our sweet and vibrant pink beauty, you’re our garden star for March! Though still lovely we can see that this year-round flowering tree with gorgeous bunches of whitish flower-like bracts is past its glory days. 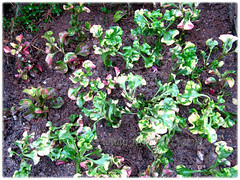 Appears stressed out with more leaves falling prematurely and it’s producing new leaves that are stunted too. Upon closer inspection we noticed that the tree is raided by mealy bugs. Aargh!! Have to hard prune it pretty soon but will delay a little further until the hydrangeas that it’s sheltering have finished flowering. We rarely apply pesticides as I’m allergic to them. Some other flowering plants in March that are smiling for us are the reds, like the Azalea indica (Indoor/Sim’s Azalea) and Heliconia stricta ‘Carli’s Sharonii’ that are struggling to maintain their youth, but the Calliandra emarginata (Powderpuff Plant) and Ixoras (Needle Flower) are going on strong. Our Hydrangea macrophylla ‘Endless Summer’ plants have been blooming so well in March. The clusters of blue flowers are marvelously large and truly add a temperate touch to our front yard. 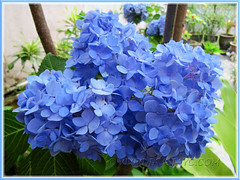 Blue-coloured flowers are such a rarity in gardens and are seldom displayed as well as the hydrangeas with their large and showy flower heads. We simply love them. Dendrobium phalaenopsis ‘Sonia’ blooming for the first time after repotting, probably almost a year ago. Great show that will last a couple of months! 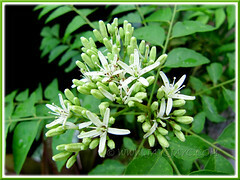 Murraya koenigii (Curry Leaf Plant) flowering for the first time after many potted years. How lovely and flowers are sweetly scented too. Yay! We got a lovely new addition to our garden on the last day of March. 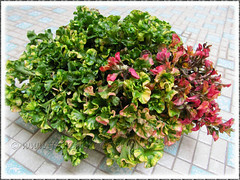 Presented to us by Theresa Cheong – a wonderful friend who has these colorfully attractive plants grown as ground cover in her garden borders. ID please? We’d appreciate if someone can provide its botanical name… I’ve googled unsuccessfully for its identity. Woo…hoo! We’ve got its ID finally! 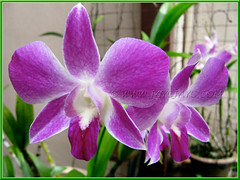 Got it from browsing our new book titled, Tropical Horticulture & Gardening. Thanks again, Dr. Francis Ng! Common names: Joseph’s Coat, Parrot Leaf, Calico Plant. I didn’t know that Hydrangeas could grow in tropical Malaysia. Are they easy to grow in pots as they can grow very big. I’ll have to look out for them at the garden centre. I got the recipe from Wendyl Nissen’s book, Domestic Goddess on a Budget. From New Zealand. I used it on my garden every week. I only had problems when I let it steep for several hours and the garlic burnt my fern. But I love it as it’s so organic. No problem if it goes on you and you can use a detergent that is suitable for you. Hope it helps. I sprayed every week for a month, and now I spray once a month. Hydrangeas can easily be pot-grown, Nicola. Those hybrids available at garden centres are dwarf versions and most ideal for containers. Thanks for your sweet words about our garden and sharing the recipe for the organic pesticide…we’re keen to try that out. Otherwise some of those plants like the dumbcane and aglaonema that are magnets for mealy bugs have to go. Incidentally, our garden was much lovelier and fully-packed a year ago i.e. before we trim down heavily on the numbers due to ill-health and time constraints. Thank you for the tip re hydrangeas. I’m going to look out for them. They remind me a lot of my hometown and family. I’ve got a few plants which attract the mealy bug too. But the spray has wiped them out. I keep checking, afraid to see them, but not yet. Let me know how it goes. I hope you health is getting better. You’re most welcome, Nicola. All the best in your search and may they bring you much joy and sweet memories. 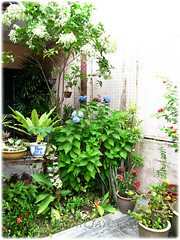 Hope to prepare the organic concoction tomorrow and really looking forward to apply it soonest to our ailing plants. Sorry, I wasn’t specific about ill-health… it’s my beloved John who’s unwell with lumbar spondylosis and has to slow down on garden activities. Anyway, he conveys his thanks for your well wishes. 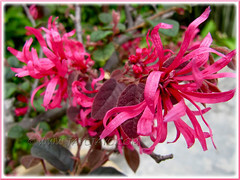 Think my 2 pots of Pink Chinese Loropetalum are in dire need of a haircut too! Do it, my friend, and you’ll be amazed with its rewards! 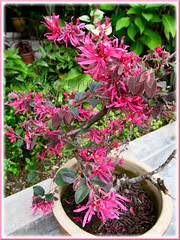 Wow, there’s a lot of blooms in your Chinese witch hazel. I’m trying to grow one now. 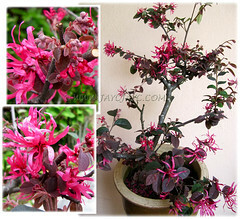 From experience, this Pink Chinese Loropetalum puts on a remarkable show for us only after a trim. Hope your plant blooms well for your too, A. Belle!